Google Analytics tracking is an option of the mailing list. It’s setting will affect all campaigns sent from the mailing list. It is disabled on new mailing lists by default. The setting can be updated when creating the mailing list or after it’s been created. Click the YES radio button for Google Analytics Enabled. This will display a list of options required to track open and click events. Fill in Source field. If you track multiple mailing lists on the same analytics account, the mailing list name is a good candidate for this. If you want to track clicks to specific domains from your campaigns activate restrict domain list and enter the domain or domains that you want to track in the tracking domains text box. Every click is recorded as a page visit to the link that is being tracked. Every open/view is recorded as an event, using the event interface. This information will complement what Analytics gathers from the browser and other sources, which makes it possible to analyse campaigns assigning goals and monetary value to some interactions. It is also possible to follow the user flow from each email campaign and many other possibilities. 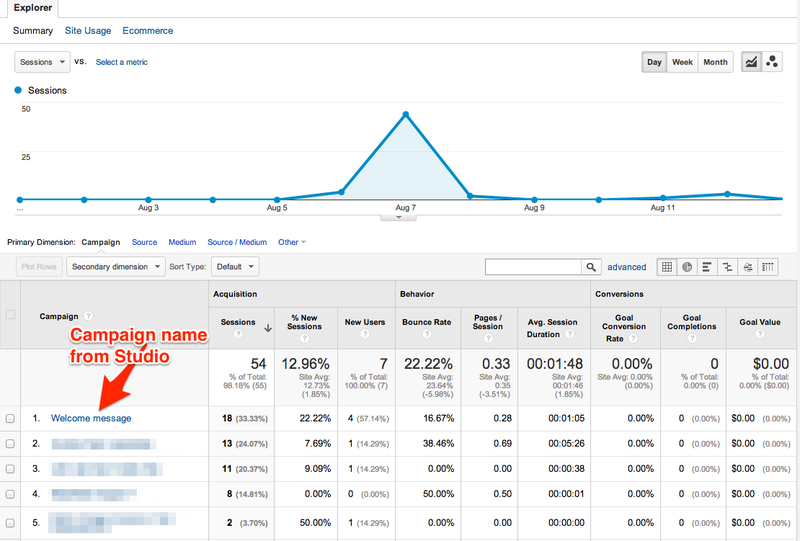 This screenshot shows how clicks from GreenArrow Studio campaigns are registered in an Analytics account. 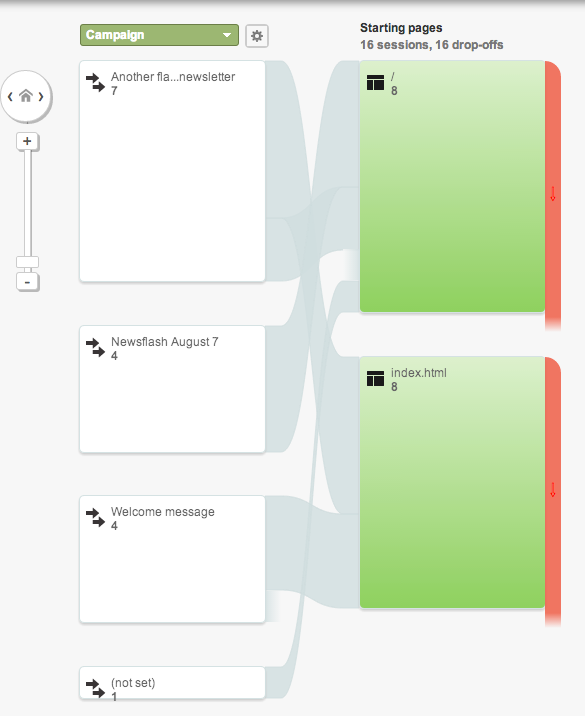 This screenshot shows the subscribers’ flow through the page, using the campaign value as the primary dimension. It shows how each campaign generated visits to different parts of the website. When a subscriber opens or views an email Studio sends an event to Google Analytics with the tracking code that was configured in the mailing list. 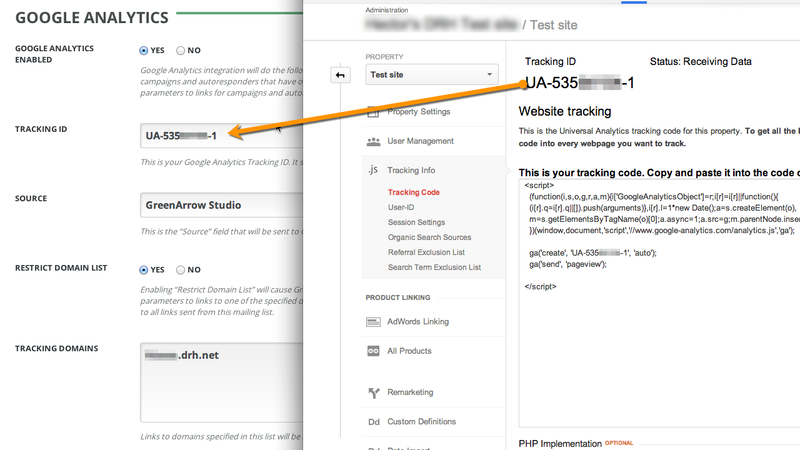 Due to the open tracking provided by GreenArrow Studio’s Google Analytics integration, users that have been manually adding UTM tracking to links may see a substantial increase in the volume of data sent to Google. This is normal and expected due to the relationship between opens and clicks - a click is almost always preceded by an open.